A full range ribbon speaker for the 21st century. 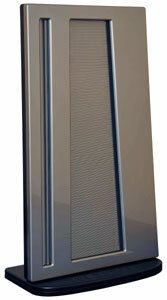 Use of rare earth magnets enables the highest efficiency seen for such a speaker, so amplifiers 20-100WPC can be used. Super light ribbons combined with the high efficiency equals incredible transient response and clarity across the whole frequency range.